On Tuesday evening I attended the BRC (British Retail Consortium) Future Retails Leaders 2018. Located at the beautifully renovated RCGP HQ in Euston Square, I arrived as Helen Dickinson OBE, current chief exec of the BRC was introducing the two speakers for the evening, Angus Thirlwell, CEO of Hotel Chocolat and Anthony Thompson, CEO of clothing brand, FatFace. Angus began by talking us through the importance of brand. He explained that your set of ideals that meld people together will be what your customers buy into. In order to decide what your set of ideals are, you need to decide what your own personal happiness or achievements look like. When you have those, you’re on your way to creating great brand values. 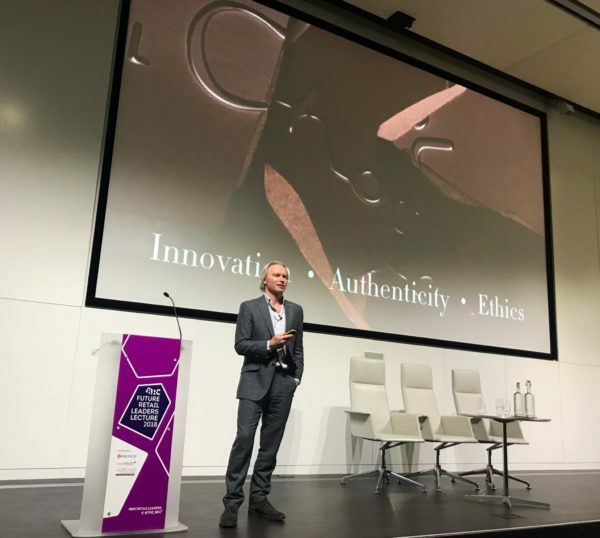 Hotel Chocolat’s are innovation and authenticity – he says this is essential for making sure his team know all they need to know about chocolate, what he called ‘proper knowledge’ through time investment – and ethics. Ethics he argues, is what makes their chocolate special. They have a cocoa plantation in St Lucia and believe in treating the locals who work on the estate fairly, and making sure that all the materials they use are environmentally friendly. When Angus started, Thorntons was very much the market leaders at the time. Interestingly, it didn’t take long for Angus to find his niche when he realised one major difference between the definition of chocolate and confectionary; one was sugar based and one was cocoa based. Hotel Chocolat ensured their products were the latter. They now have 93 stores globally and an annual turnover of over £100m. Then we met Anthony Thompson, chief exec of FatFace, the clothes and accessories store which started by selling T shirts at ski resorts. After looking at Anthony’s impressive CV – previously MD of the George brand, an executive director of ASDA stores, former retail director at M&S, senior vice president of GAP and chief exec at Blackwell – I understood why I had walked away pretty inspired after he’d shared with us his views on what makes a good leader in retail. Although his background is in retail, his tips resonated with me as he talked through his 10 pointers to being a successful leader. Know who you are and what you stand for – and act it. People in charge are liked if they are credible and have strong values. Know the difference between wrong and right and stand up for the truth. Never compromise your values, particularly if it’s for career progression because eventually you will fail. Hard work and work hard. Success is not easy and it is not free. Prepare to put the leg work in. Make every day count. You have between 9,000 and 10,000 days in your life to really make a difference. Every day is a golden opportunity to be positive and only you get to wake up and choose your attitude. Be curious. When you leave formal education, that’s when you really learn. The most important thing in life is not the piece of paper you have that says how qualified you are, but to ask really great questions. Look after you. This is not meant to be for vanity reasons. This is to ensure that you don’t burn out, because if you do, it’s not fun. Running a business is physically and mentally exhausting. You have to make sure that you balance time between work, family and friends and take time for yourself. Go for a walk in the morning, have a cold shower, reflect – anything! But remember that you only get one chance to look after your mind. Hire great people and look after them. Forget CVs, psychometric testing and checking what education they have. Instead, look into the whites of their eyes and hire based on their attitude, they can train for skill later. Ask yourself is this someone who you want to work with when you’re having a really good day, as well as a really bad day? But always follow up and check their references. People do not do this enough. If something does not sit right, don’t feel guilty for walking away. Diversity has always delivered much better results but ultimately it has to be a team you have fun with and that want to work hard. Customers. Obvious but so important not to forget. Expectations are forever changing from the customer where they now have another voice on social media but never forget who your product is for. Have a great product. And be passionate about it. Simplify the business. Have a business plan that provides clarity and that anyone can understand. If it sounds like bulls*it, it probably is. For this, use two simple tests; the pub test and the float test. If you’re at your local and you speak to the person next to you after a few, can he understand your business? If yes, you’ve passed the pub test. The second, the float test – when the person presents the business plan on the table, does it fall to the table with a loud THUMP! Or a gentle float? A loud thump might suggest too much detail and not enough simplicity! Unfortunately, I wasn’t able to stay for the rest of the evening, but I wanted to share my notes from the evening because I walked away feeling particularly pumped for 2018! What great thinking. Even if being an entrepreneur is not something that appeals to you, I still think these can all be applied in your every day life, especially the first five points. I hope this is useful and I wish you all the best of luck for a happy, healthy and ambitious 2018. Thank you to BRC for inviting me.